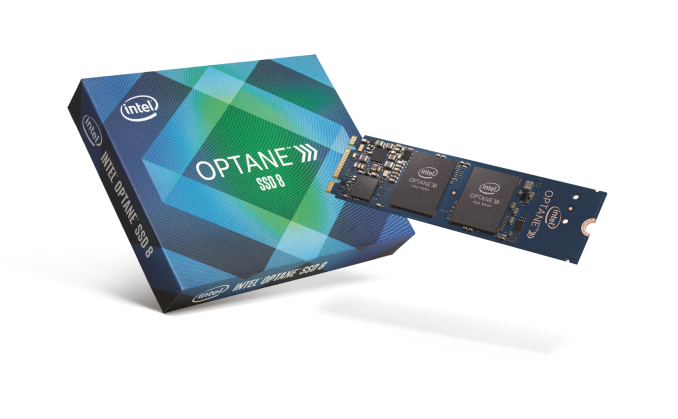 Intel's first Optane products hit the market almost a year ago, putting the much-awaited 3D XPoint memory in the hands of consumers. Today, Intel broadens that family with the Optane SSD 800p, pushing the Optane brand closer to the mainstream. The new Optane SSD 800p is an M.2 NVMe SSD using Intel's 3D XPoint memory instead of flash memory. The 800p is based on the same hardware platform as last year's Optane Memory M.2 drive, which was intended primarily for caching purposes (but could also be used as a boot drive with a sufficiently small operating system). That means the 800p uses a PCIe 3 x2 link and Intel's first-generation 3D XPoint memory—but more of it, with usable capacities of 58GB and 118GB compared to just 16GB and 32GB from last year's Optane Memory. The PCB layout has been tweaked and the sticker on the drive no longer has a foil layer to act as a heatspreader, but the most significant design changes are to the drive firmware, which now supports power management including a low power idle state. The low capacities of the Optane Memory product forced Intel to position it as a drive specifically for caching in front of a much larger hard drive, but the Optane SSD 800p has enough space to serve as primary storage. While 64GB-class drives have disappeared from current flash-based SSD product lines, there are still plenty of 128GB-class drives around. These drive capacities certainly aren't roomy, but they are sufficient to install an operating system and several applications. For users that don't install huge AAA video games or deal with large collections of videos and photos, the 118GB 800p might not even feel too confining. For flash-based SSDs, tiny capacities should often be avoided because they have much worse performance than larger models. The relatively small 128Gbit (16GB) capacity of a single 3D XPoint die means the Optane SSD avoids the limited parallelism that small flash-based drives suffer from, and the performance of a single 3D XPoint die is high enough that not much parallelism is needed to begin with. The higher capacities that the Optane SSD 800p offers over the Optane Memory also allow for much higher write performance, which was the biggest weakness of Optane Memory. Still, this only brings the 800p up to performance levels slightly faster than SATA, with sequential write performance rated at 640 MB/s and 4kB random write at 140k IOPS. Read speeds are slightly faster than the 32GB Optane Memory and also look poor compared to flash-based SSDs, but Intel is specifying this performance at a queue depth of four, which is far lower than what most flash-based SSDs need to hit their peak throughput. The addition of a low-power sleep state brings the idle power rating of the 800p down to just 8mW, compared to the 1W rating on the smaller Optane Memory modules. The endurance rating for both capacities is 200 GB/day for the five-year warranty period. Given the small capacity of the drives, this works out to 1.7 or 3.4 drive writes per day, which is considerably higher than normal for consumer SSDs. The capacities of 58GB and 118GB look odd compared to the more usual amounts like 120GB or 128GB commonly seen for flash-based SSDs. The reason the 800p has slightly reduced capacity is that a 3D XPoint die's actual capacity really matches the nominal 128Gb, whereas NAND flash incorporates extra space above the nominal capacity to allow for error correction and wear leveling. For the Optane Memory, the difference between the power of two definition of 32GB and the traditional drive manufacturer's definition of 32GB provided sufficient space, but the 800p's metadata and error correction requires a bit more usable space be taken. Pricing for the Intel Optane SSD 800p is similar on a $/GB basis to the Optane Memory, which is now significantly cheaper than the launch prices from last year. However, this still leaves the 800p as the most expensive consumer SSD on the market on both a capacity and per GB basis, with the 58GB model exceeding $2/GB. Even the ultra-high-end 900p is cheaper per GB than the 800p. There aren't any close competitors to the Optane SSD 800p. Intel's Optane SSD 900p is a consumer-focused derivative of their enterprise Optane SSD DC P4800X and inherits its high power consumption and the large PCIe add-in card or U.2 form factors. The existing Optane Memory M.2 modules are closely related to the Optane SSD 800p, but their low capacities prevent them from being used for the same purposes. Among flash-based SSDs, there are some current-generation 128GB-class NVMe SSDs but no 64GB-class drives. The small flash-based SSDs are all relatively low-end and far cheaper per GB than the Optane SSDs. The high-end NVMe SSDs that roughly match the 800p on price tend to have four times the capacity. For this review, we are comparing the 800p against Intel's other Optane products and against a variety of flash-based NVMe SSDs ranging from entry-level drives to the premium Samsung 960 PRO. Intel also sent us four of the 118GB model, so for the curious we have some benchmark results from using them in RAID. For those tests, the Optane 800p M.2 modules were installed in an ASRock Ultra Quad M.2 card and tested in our enterprise SSD test system, using Windows 10 and Intel's Virtual RAID on CPU (VROC) drivers. That enterprise test system includes all the latest firmware and OS patches for the Spectre and Meltdown vulnerabilities, so those test results reflect the overhead of those mitigations in addition to the overhead of the NVMe RAID software. The single-drive test results were all recorded on our usual consumer SSD test system that has not received any firmware or OS patches for the Spectre and Meltdown vulnerabilities. Caveat: Many of our current SSD tests were not designed with tiny drives in mind. The results for the 32GB Optane Memory and the 58GB Optane SSD 800p do not represent exactly the same workload performed by the larger drives. Several of our synthetic benchmarks of sustained performance default to using a 64GB span of the drive, and in the case of the smaller drives, the test simply uses the entire drive. Likewise, the workloads represented by the ATSB Destroyer and Heavy tests don't actually fit on such small drives. The small drives still perform the same volume of reads and writes, but the block addresses in the I/O trace that are beyond the capacity of the drive are wrapped around to fit. The ATSB Destroyer and Heavy results for those two drives could be viewed as representative of the drive's performance as a cache device, but they do not include the effect of cache misses that would be present in a real tiered storage configuration. - they were willing to include ENOUGH flash (128GB) and fast flash; they didn't cheap out. But yeah, the solutions sold by Seagate were not (in my experience) very impressive, especially considering the ridiculous premium Seagate charged for them. Sounds like Apple Fusion drive. Very difficult to do well on drive-level, much easier to do well with some OS support and filesystem level. Optane basically is a variation of Phase-Change Memory. It's been around a long time, but Micron/Intel have finally managed to make it in large enough capacities to productize it out of niche markets. There are other contenders for next gen memory &storage, ranging from MRAM (magnetic memory) to ReRAM to racetrack memory (HP has claimed to be on the edge of productizing that for about four years now). At least the 860 EVO and Pro improved endurance a lot for consumer.